On Facebook’s Gift Shop, you need to purchase credits on the site (via credit card), that cost 10 cents in U.S. currency are are available in 15 different countries. With the enhanced version of the gift shop, you will be able to purchase songs as gifts for your friends. Powered by Lala.com, the gift shop will offer over 8 million songs from a vast variety of artists ranging from Mozart to Beyonce. Web songs cost 1 credit (or 10 cents) each, while full, downloadable, and digital rights management-free (DRM) MP3s are 9 credits each. Some of this money goes to Facebook but Lala takes a cut of every transaction. But you don’t have to have a Lala account to play or receive a song. 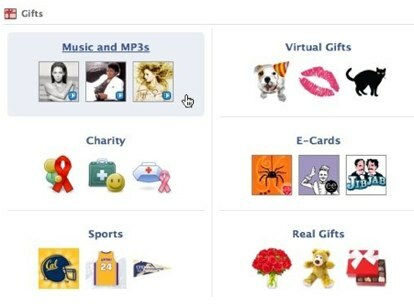 So how do Facebook users play their songs form the social network? You can play songs from your news feed or from Lala.com’s platform, which they can connect to via Facebook Connect. If you buy an MP3, you can also download the songs you can play the tracks on iTunes or other music players. Facebook users who can see the music gift on other friend’s feeds can play the song in full once, after which they will be able to play a 30-second clip. Facebook is also getting a little more sports-friendly by adding branded virtual gifts from professional and college teams. Officially licensed gifts from the U.S. National Basketball Association and U.S. Major League Soccer are now available in the Gift Shop, as well as school-themed gifts from a number of major U.S. colleges ranging from Oklahoma State to Stanford University. While you can currently purchase gifts from non-profits, like Kiva, Project Red, TOMS Shoes, Charity Water and the World Wildlife Fund, Facebook is now also including gifts via the Causes application. So you can make donations to a cause as a gift for your friends for pretty much any cause supported through the app. The concept of Facebook as an e-commerce platform seems to be lifting off. PayPal is partnering with Payvment to help any Facebook user set up a retail storefront. Not to mention the immense popularity of virtual gifts on the platform. And with this new announcement, it seems that not only if Facebook opening up a revenue stream, but the network is creating a totally new way for users to socially engage with the platform: through music.